Get your message in front of your customers with a personalized notepad. Think about this. 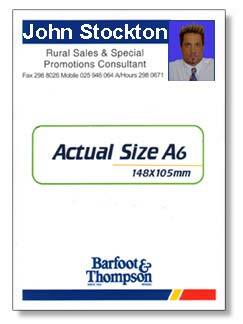 With a 40 page Notepad at a unit price of $1, means each impression costs as little as 2.5cents. If a page gets passed around as it usually can, to others your impressions have just gone up and so your cost per impression decreases also. This is real value for money and a great promotional tool that you cannot afford to be without. 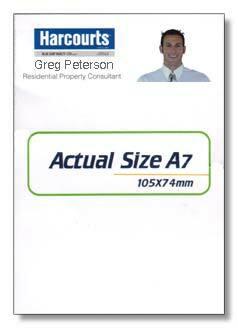 Many marketing and promotional companies use the personalized notepad to great effect. You can to, now that you know how to. We provide the best prices and service available. Please, also be sure to check out our great pricing on our pen and calculator selections as well. These items compliment your personalised notepad. Earth First has red hot deals on full colour notepads, these are an awesome way to promote your business. Each pad has a cardboard backing and 40 sheets with your promotional message on. Grow your income with a promotional gift that lasts. People will remember you! *All files supplied must have a canvas size of 152mm x 109mm to allow for guillotining and a text safe zone of 144mm x 101mm. Please note: No printing to be closer than 3mm to any edge. If you would like further information on this great product or other personalized products please feel free to contact us. If you are looking for different sizing please request a quote.